The weeks just seem to fly by, don’t they? 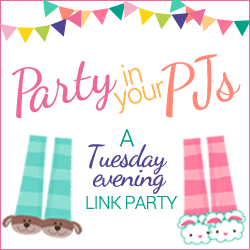 It’s Tuesday and that means it’s time for another Party in Your PJs; a great opportunity to show off your newest thoughts, projects, recipes, ideas, creations, etc! Before we start I want to quickly share these super easy and cute little spiders the grandkids and I made yesterday. I had everything on hand already which was great. I used a pack of 6 styrofoam balls left over from Christmas last year, pipe cleaners, googly eyes and of course craft glue. I painted the balls black before the kids came over, but the girls wanted their spiders to be colorful and repainted them. So my suggestion, don’t bother pre-painting. Let the kids paint away! After painting, we cut a pipe cleaner into 4 equal pieces for legs. Two pipe cleaners per spider. Bend the pipe cleaner into the best spider leg you can imagine and poke one end into the foam ball. If you want them to be really secure, after you get your exact placement you might want to pull the leg back out and add a drop of glue before reinserting. Add your googly eyes and any facial features you want and there you go a cute and easy little spider to adorn your house! Ok, moving on to this weeks featured bloggers! 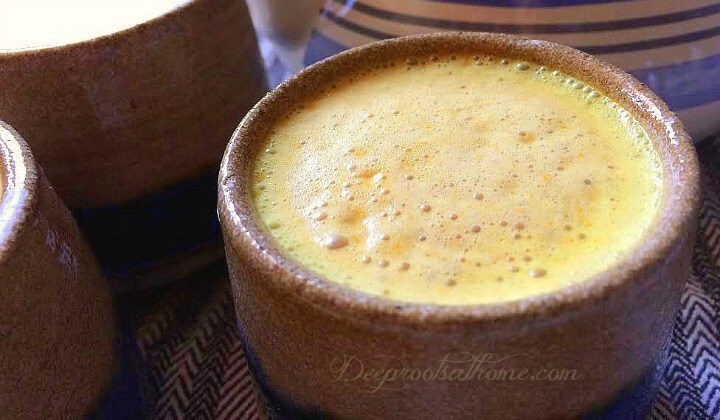 My first feature from last weeks Party in Your PJ’s is Mexican Hot Cocoa with Turmeric, Coconut Oil, Maca & Spices from Jacqueline at Deep Roots at Home. According to Jacqueline this cocoa will slow down aging and increase your overall strength, stamina and mental sharpness. I don’t know about you, but I need some of that! 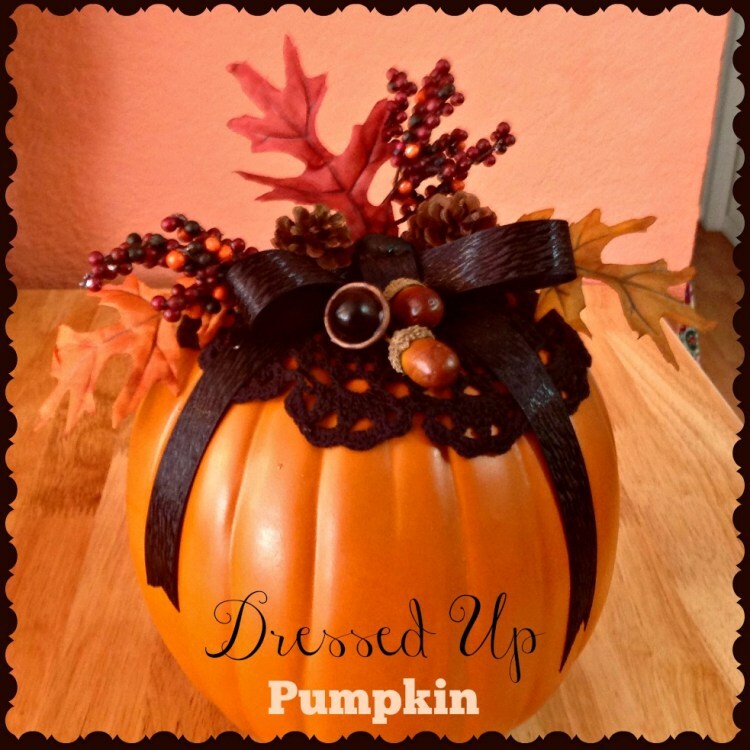 My second feature is this Dressed Up Pumpkin from Recipes and Ramblins from the Tumbleweed Contessa. If your life is really busy right now and you’re looking for an inexpensive, quick and easy fall craft, this is it! 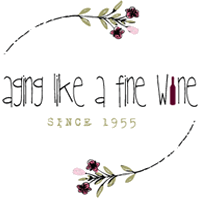 It would be wonderful if you would stop by and visit both of my featured bloggers and give them a little blog lovin and support! Congratulations to the featured bloggers! Please remember to copy and paste this featured button to your website. So here we are, ready to jump into another Party in Your PJ’s. Please join us and link up a post and stick around and read the other wonderful blogs that have linked up! Such cute little spiders! What a fun activity to have with the grandkids. Thanks Amy, it was fun and so easy! Thanks so much for hosting each week and for taking the time to stop ny! Love those darling spiders!! Thank you for linking up each week Debbie!